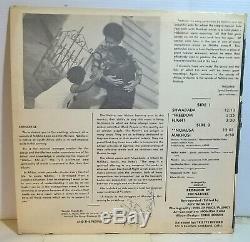 Trilyte 7001 extremely rare'71 private press LP. From internet review: 1971 REVOLUTIONARY SPIRITUAL AFRO JAZZ FROM EXILE Matsuli Music presents soul, spirituality and avant-garde jazz from South African political exile Ndikho Xaba. Its rarity has until now served to obscure both its beauty and its historical significance. 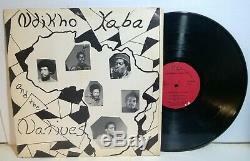 Making profound links between the struggle against apartheid and the Black Power movement in the USA Ndikho Xaba and the Natives is arguably the most complete and complex South African jazz LP recorded in the USA. It stands out as a critical document in the history of transatlantic black solidarity and in the jazz culture of South African exiles. Ndikho Xaba and the Natives opens a fluid channel of sonic energy that courses between two liberation struggles and two jazz traditions, making them one. It is a critical statement in the history of transatlantic black solidarity, unifying voices stretching from San Francisco to Johannesburg. There is no other recording or group in which the new jazz spirituality of the late 1960s is so fully blent with an African jazz tradition. 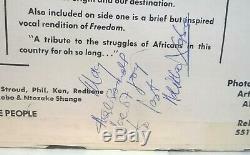 Signed on the back by Ndikho. Jacket Grade: VG++ Little wear to cover art. A little bit of spine wear and chipping. Record Grade: VG++ to NM- PLAY GRADED. Little to no visible play wear. A few light surface marks from missing inner sleeve. Cleaned on the VPI and plays NM- with little to no surface noise throughout. A couple of tiny tear marks on side 1 label edge. Price is determined by your zip code. Or use rate calculator at bottom of page. ALL FUNDS MUST BE IN U. Last Vestige Music Shop 173 Quail St. The item "NDIKHO XABA & The NATIVES'71 Trilyte RARE Spiritual Afro jazz soul funk signed" is in sale since Monday, April 1, 2019. This item is in the category "Music\Records". The seller is "lastvestigemusic" and is located in Albany, New York. This item can be shipped worldwide.